Tea was originated in China during the Shang dynasty as a medicinal drink. An early credible record of tea drinking dates to the 3rd century AD, in a medical text written by Hua Tuo. The Chinese have consumed tea for thousands of years. People of the Han Dynasty used tea as medicine (though the first use of tea as a stimulant is unknown). China is considered to have the earliest records of tea consumption, with records dating back to the 10th century BC. Another early credible record of tea drinking dates to the 3rd century AD, in a medical text by Hua Tuo, who stated that “to drink bitter t’u constantly makes one think better.” Another early reference to tea is found in a letter written by the Chin Dynasty general Liu Kun. Tea was first introduced to Portuguese priests and merchants in China during the 16th century. Drinking tea became popular in Britain during the 17th century. The British introduced tea production, as well as tea consumption, to India, in order to compete with the Chinese monopoly on tea. The story of black tea in Sri Lanka began in the year of 1867. A Scotsman James Taylor cleared 19 acres of forest in the District of Hewaheta Lower to plant his first seedings in what is now known as the No.7 field of Loolecondera Estate. As history says,Taylor made his home in Loolekondera and died 40 years later. James Taylor’s legacy is best summed up in the words of John Field, a former High Commissioner of Great Britain in Sri Lanka. He wrote: “It can be said of very few individuals that their labour have helped to shape the landscape of a country. The beauty of the hill country as it now appears owes much to inspiration of James Taylor, the man who introduced tea cultivation to Sri Lanka”. Today even people who have never heard of Sri Lanka are familiar with Ceylon tea. And with good reasons, Quality, Exquisite flavour, Fresh and Full bodied from Sri Lanka. In Sri Lanka, hospitality means a cup of tea. There’s greeting, warmth and fine taste captured in it. Orthodox teas are considered as such because they follow a much more traditional process. The leaves are hand picked depending on the tea to be produced, typically it will be the tea bud alone, the bud and one leaf, or the bud and two leaves. In many cases, the tea pluckers have learned to make tea from the older generations of their family, who in turn learned from generations before. Some of these specific processes have been taught to the next generation for hundred of years, perhaps even over 1,000 years in some families. Orthodox teas are the higher quality tea options in today’s market. They are full leaved and flavorful, with unique characteristics that will vary depending on who actually makes the tea (among other things). To top it off, the full leaves allow you to get more of the natural antioxidants in the tea to be most beneficial health-wise. 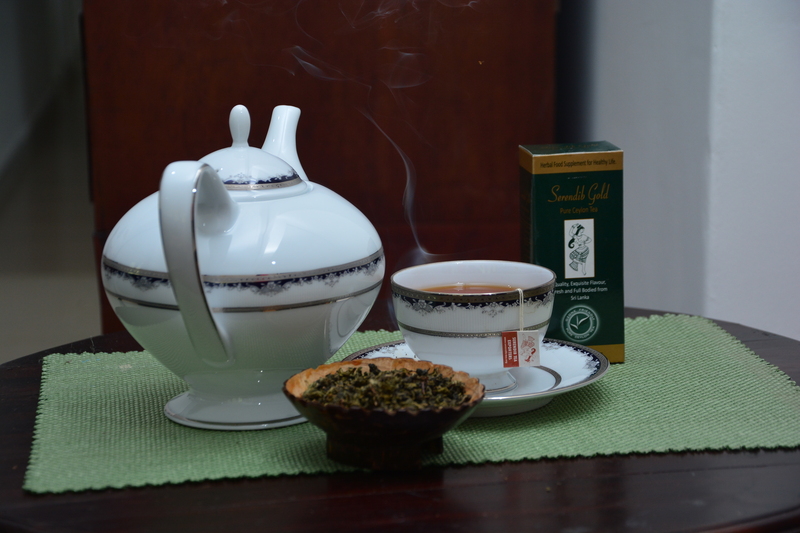 Serendib Herbal Diabe Tea is the only single origin herbal tea originating from Sri Lanka. We only use straight line tea from highland estates to guarantee exquisite flavour, quality, freshness and full bodied which is wholemark of Pure Ceylon Tea. Ceylon tea benifits your health with its antioxidant component which is a leading cause of blocking LDL (bad cholesterol), lower the risk of heart disease, and tea polyphenols have been found in animal studies to inhibit tumorigenesis at different organ sites, including the skin, lung, oral cavity, esophagus, stomach, small intestine, colon, liver, pancreas, and mammary gland.With recent researches conducted it has been proven that tea consists of medicinal value safe for mankind.